Beatnic – just wondering – Questions and observations from Nic Price. Curious about how things work and what it's like to use them. I’ve started work on a side project with Ben. We’re calling it Participant Discovery. We want to understand what it’s like to be a research participant. We wonder if understanding this will help us design better research. We’re blogging about it over on the People Thinking website. I once had to do a one minute silence on the radio. It was on Mother’s Day in March 1996, the Sunday following the horrific Dunblane massacre, in which a gunman killed 16 children and a teacher at a Scottish primary school. We were running Sound Radio – a community radio station – from an empty flat on an estate in Hackney, north-east London. We’d rigged up the studio, and were on air for a month. I worked as a producer and presenter and also drove the desk. Somebody needed to be at the studio 24 hours a day, so we organised a rota. I was on the nightshift that weekend. As a tribute to those killed in Dunblane, there was to be a national one minute silence at 9:30 on Sunday morning. From 8:00 am that day we’d scheduled two hours of pre-recorded comedy. I wrote a script and rehearsed it a couple of times, timing myself, so I’d know how many seconds beforehand I’d need to start reading it on air. At 9:29 and 46 seconds I brought down the faders on the comedy programme and faded up my microphone to announce the silence. For a silence on the radio, you can’t turn your microphone off. If you do, it’ll sound to the listener like their radio isn’t on, or there’s a fault with the radio transmission. To avoid this, I left the microphone open for the 60 seconds, so the listener would hear ‘atmos’ as it’s called. It didn’t feel right to go back to the comedy, so I’d put together a playlist of songs which felt appropriate to the moment, starting with the Kate Bush and Peter Gabriel duet Don’t Give Up. I’m going to start blogging again. There. I’ve said it. Out loud. On here. So it’s public, even if it’s not going viral. Amongst other things, I plan to write about sharing, listening, making time, paying attention, noticing, designing systems, and information architecture. First up, I’ve updated to using the WordPress 2017 Theme – it plays nicely on all screen sizes. And it looks okay from an accessibility point of view – though the blog title and description may not pass the legibility and/or contrast test, depending on which image appears in the site header. I’ll probably tweak the theme a little as time goes by. Despite my neglecting it, the site still gets traffic. UX Bristol 2014 Short Talk: Nic Price – Systems Thinking in 3 Minutes from Bristol Usability Group on Vimeo. Okay so it’s nearer 8 minutes. In which I talk about elephants and bicycles… world view, mental models, Russ Ackoff’s definition of a system, and what happens when you change the boundaries of a system. For more videos, see the UX Bristol 2014 album on Vimeo. Working in digital product research and design, I can’t remember a project where we didn’t use a prototype in one form or another. 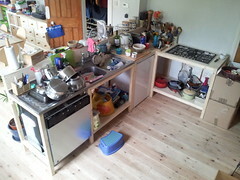 We’d worked up the eventual kitchen design through various discussions with Sam from IT Woodwork. Sam provided us with pictures from his Sketchup model. Then Simon from Neighbourhood Construction worked his magic and in next to no time had built a prototype from 2by2 and ply. It’s fully functional, and all the appliances are in the places they’ll end up. This means we’re able to spend a few weeks testing out the layout for ergonomics, and can make any adjustments if we need. 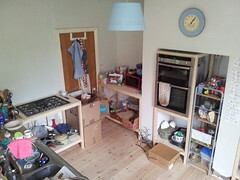 And to top it all, each unit is standalone and reusable elsewhere afterwards. We’re calling it dweller-centred design. Projection Hero, a photo by Beatnic on Flickr. I learned to be a projectionist in the early 1980s. Our physics teacher at school, Mr Smith, taught me and a friend. We would practice “lacing up” the film, focusing the lens and switching reels as quickly as possible. We learnt to cut and splice the film to make edits or repair damage. So when I went to Bristol’s Watershed Centre on Wednesday, I was immediately drawn to “Projection Hero” which is currently installed there. It’s a collaboration between Charlotte Crofts of UWE, and Tarim. Inside the cabinet, a QR code is generated, which you can scan with your handset. This will take you to a uniquely generated URL showing you the projectionists controls. You can dim the lights, open and close the tabs (curtains), move to the next reel… all using your handset. 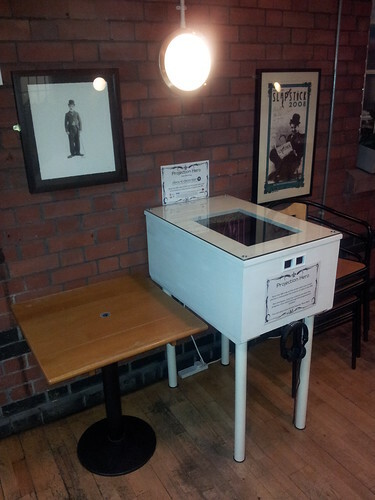 Read more about the Projection Hero project on Charlotte Crofts blog. 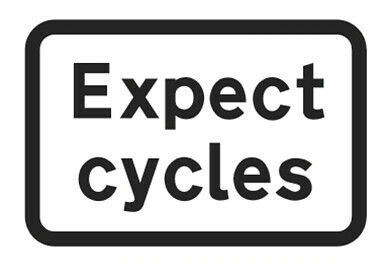 An idea for a road sign, following the news that “Except cycles” signs have been given the go ahead (see article on LCC website for further info). One of the numerous different jobs I’ve had was driving cars being sold at auction. It was in the early 1990s, during my second stint at university. As I had no lectures on Wednesdays one year, and I needed the extra cash, I signed up with the temping agency Office Angels. They called me in. The auction house was just off Plough Lane, near Wimbledon Football Club’s old ground. Over a couple of terms I must have driven about 200 cars, in all shapes, colours and sizes and in varying degrees of roadworthiness. From Minis to Mercs, from Reliants to Rollers. I’d turn up each Wednesday at the Portakabin at 8.30am, put my overalls on, drink an oversweet instant coffee and smoke two or three roll-ups while reading the red-tops with the rest of the drivers. At around 9.00am we’d head up to the old multi-storey car park, filled entirely with cars for auction. The supervisor, clipboard in hand, would point at each of us in turn and then point at our respective car. Then, with a bit of luck, the engine would start and we’d spiral down the multi-storey and form a queue outside the auction hall – really just a huge shed, with a carpeted space in the middle for each of us in turn to aim our car at, and a raised platform to the right for the auctioneer and his gavel. If the car conked out in the queue, then you would be humiliatingly rolled on to the carpet by a few colleagues, causing cackles of laughter from the assembled buyers. Wheeler dealers everywhere, mobile phones (still on the small brick scale) glued to their ears, sheepskin and leather jackets. A lot of cigar smoke. This was Arthur Daley territory. Sitting in a car, that’s being auctioned, is like being on a very strange stage. And for some reason I used to feel slightly responsible for whether or not the car sold. If the car went for a good price I’d feel quite chuffed. But if it didn’t sell at all, and then you had to be pushed off because the engine had died, I can imagine what it might feel like not to get through to the second round of auditions in Britain’s Got Talent. Then it was back up to park the car, and pick up the next. At the end of the excellent UX Bristol back in July, a few of us gave 5 minute talks. These talks are now available to watch online. I talked about how – when I was running the intranet at the BBC back in 2005 – I was inspired by the transformation programme at London’s South Bank Centre. I found it a useful analogy for the work we were doing to transform our digital workspace. Useful to a point, I find analogies can become most interesting at the points where they break. This is a short version of the longer talk I gave at London IA back in November 2010, which Martin Belam blogged about. See also Matthew Solle’s post Conversations Over Coffee for some more background and a little bit of ranting.